Downgrade iOS 9.3.2 to 9.1 / 9.0.2 for Jailbreak purpose iPhone 7 6 6s Plus SE 5s 5c 5 iPad Pro air 2 iPad mini 4. iTunes Error 3194,100,1671. Every time a new iOS version is released (in our case now iOS 9.3.2), there are always people who accidentally updated to it when the OTA update pops up on their iPhone or iPad. iOS 9.3.2 was released not long ago. Those who have mistakenly updated to it without knowing that iOS 9.3.2 is still not available for jailbreak yet from a jailbroken device are probably looking very hard for a way to downgrade iOS 9.3.2 to iOS 9.1 or iOS 9.0.2 for a possible re-jailbreak. Is downgrading iOS 9.3.2 to iOS 9.1 or 9.0.2 still possible now? Sad to say, no, there is no longer a way to downgrade iOS 9.3.2 to iOS 9.1 or any version below iOS 9.3.1 anymore. Apple has this little procedure that each iOS installation has to be signed by Apple before a device is able to install it. This is why every time you restore your iPhone or iPad, you will need to have a working internet connection in order to proceed. It works this way: Whenever you restore to an iOS version using iTunes, after you have selected the iOS version IPSW file, iTunes will then communicate with the Apple server to see if this iOS is eligible for restoration. If Apple is still signing for that particular iOS version, it will return positive and the restore process will go through, otherwise it will return error if the iOS version is no longer being signed by Apple. Apple will usually stop signing for an iOS, in our case now iOS 9.3.1, one or two weeks after the release of latest iOS (iOS 9.3.2) version. If Apple stops signing for an iOS version, downgrading to this particular iOS version will no longer be possible no matter what you do. So, stop wasting your time trying to figure out a way to downgrade your device from iOS 9.3.2 to iOS 9.1, iOS 9.0.2 or 9.2.1 for jailbreak. It’s simply impossible now. This is how Apple forces its customers into using what they want you to use. The only possible downgrade now is downgrading iOS 9.3.2 to iOS 9.3.1. The only reason you would want to downgrade to iOS 9.3.1 should be the detrimental performance or battery issue after upgrading to iOS 9.3.2. If you are thinking about if you will miss out the opportunity to jailbreak your device if you have updated to iOS 9.3.2 from iOS 9.3.1, don’t worry, iOS 9.3.2 or maybe a later iOS will most likely be the one to be jailbroken instead of iOS 9.3.1 if a jailbreak for iOS 9.3 is to be released. There is already a rumor about iOS 9.3.2 being proven jailbroken by Luca Tedesco on a video posted on YouTube. That said, if a jailbreak is to be released for iOS 9.3 it will most likely be iOS 9.3.2 or the up coming iOS 9.3.3. So, if there is no other issue with using iOS 9.3.2, a downgrade is not really necessary. 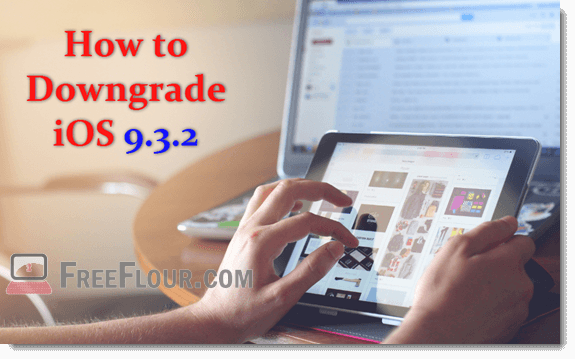 If you insist to downgrade iOS 9.3.2 to iOS 9.3.1 perhaps due to performance, battery issue or you simply want to be with iOS 9.3.1, you can do so by first downloading the iOS 9.3.1 IPSW file (according to your device model), then follow carefully the steps below to proceed downgrading iOS 9.3.2. Please be noted that at the time this post was written, Apple is still signing for iOS 9.3.1, thus downgrading to iOS 9.3.1 is still possible. If Apple stops signing for it, do not proceed. Read the update below for more info about the signing updates. Step 1 – Download iOS 9.3.1 IPSW file according to your iPhone or iPad model. Step 2 – On your device, head to Settings > iCloud > Find My iPhone. Tap on the slider to disable it. This is to make sure nothing else will interfere during the restoration process. Step 3 – Connect your iPhone or iPad to your Windows (Windows 10/8/7) PC or Mac. Download and install the latest version of iTunes if you haven’t already done so. Step 4 – Launch iTunes on your computer. Backup your device by creating a full backup using iTunes or by syncing all your photos, videos, data, etc. Step 5 – When your device shows up on iTunes, select it. Under the summary tab, hold shift + left click on the Restore iPhone button, as for Mac, hold Option/Alt key while clicking on the Restore button. A window will then pop up. Browse to the location of the iOS 9.3.1 IPSW file you have downloaded earlier. Select the file and the restoration will begin automatically. Your iPhone will reboot several times during the process. Once it’s done, your iPhone will boot with a clean version of iOS 9.3.1. Once again, do not use this procedure and attempt to downgrade iOS 9.3.2 to iOS 9.1 or iOS 9.0.2 for jailbreak. It will not work and may risk bricking your device.